Enter your dates and choose from 92 hotels and other places to stay! 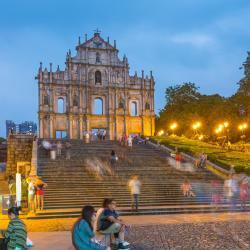 Macau presents a blend of cultures that is as multi-layered as its history. Planted firmly within today’s China, it has strong evidence of its Portuguese roots around every corner. Discover age-old ruins like St. Paul’s Church, bronze-cast statues of historic explorers, and a fusion food culture that draws a curious international crowd. 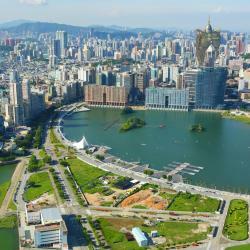 A tiny, densely populated territory, Macau sees yet more visitors flock to its famous casinos. Nicknamed ‘Asia’s Las Vegas’, the lively Cotai Strip is home to mega complexes like Galaxy Waldo and Sands Macau. Wander inside to try your hand at games like poker, blackjack and pontoon, or watch captivating spectacles that feature alongside the gaming. A welcome alternative to the casino resorts, Taipa Village is strewn with Chinese shops, temples and street stalls dishing up traditional snacks. Meanwhile, neighbouring Coloane Village boasts relaxing beaches, quiet parks and pastel-coloured buildings. The glitzy look and feel of Macau’s casinos extends to its hotels, which are many in number on both the mainland and islands. World-renowned for its iconic luxury, Asia’s largest JW Marriott, JW Marriott Hotel Macau brings its guests an approachable luxury experience through the richness of authenticity. The hotel is spectacular. The minute you walk into the lobby you feel relaxed. Ciccy greeted us at reception with a huge smile. She couldn’t be nicer throughout our stay. The room was extra large, the view from the huge window was awesome. The bathroom was out of this world...I wanted to take it home with me. I’ve stayed in a lot of luxury hotels and this tops them all. Looking forward to returning very soon. 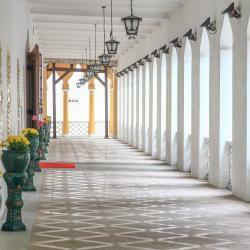 Galaxy Macau offers luxurious 5-star accommodation within the Galaxy Macau Resort, across Macau’s ‘Old Taipa Village’. It features the world’s largest Sky Wave Pool and offers free WiFi in rooms. The entire hotel is really nice has nice touches like mini bar for free and luxury brand soap/shampoo. The pool is amazing the breakfast is ok. We enjoyed our stay. Only a 5-minute drive from Macau Airport, the Grand Hyatt Macau offers large rooms, an outdoor pool and a 24-hour fitness centre. It features a spa and free Wi-Fi. We stayed for the weekend to celebrate my fiance's birthday and the service was incredible from the moment we arrived to the moment we left. We were upgraded to a suite with a fountain view and my fiance was given a cake and birthday card on arrival. Tina, Echo and her team went above and beyond to ensure we had a wonderful stay. Thank you so much! 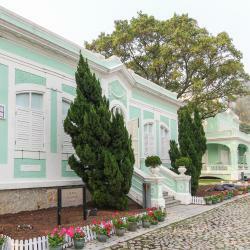 Located in the heart of Taipa, Altira Macau is conveniently within 2 km to Taipa Houses Museum and the Orient Golf Club. I have order the room service ,and they provide very good service and food. And the room viewing is very nice ! Boasting an indoor swimming pool and a fitness centre overlooking the gorgeous coastal seascape with dramatic sea views, the 5-star Crowne Plaza Macau is only a 5-minute drive from Macau Ferry... I love the free room upgrade and complimentary welcome drink. The staff is very nice and polite especially Mr. Rhuel of Concierge. Discounted breakfast buffet is awesome and the food is great! 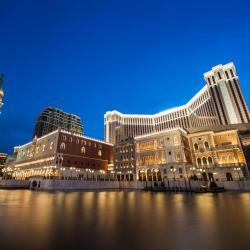 Offering high-class and spacious guest rooms in Macau, The Venetian Macao Resort Hotel features a luxurious casino, branded shopping options, outdoor swimming pool and 30 stylish dining options... Brilliant place to be in macau. Offering a seasonal outdoor pool and various entertainment facilities, Studio City Hotel is located in Macau, a 5-minute drive from The House of Dancing Water. Great location and atmosphere. Fun hotel, best suited to families. Room was comfortable and amenities fantastic. Staff were very friendly and we received the most delicious cheesecake as a honeymoon gift. Would definitely stay here again. Boasting a rich collection of dining options, Broadway Macau offers high class guest rooms, shopping mall and outdoor swimming pool. Free WiFi is available throughout the property. Due to typhoon they changed our stay from Broadway to Galaxy without any extra charge. Nice!